Where oh where did the goatldi go? 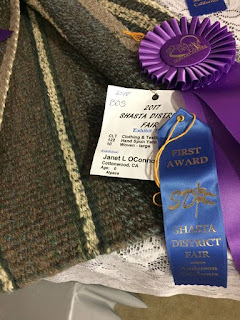 She went to the Shasta District fair. I haven't been to a fair in about nine years. 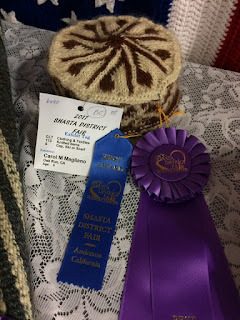 There were those wonderful 4H years with my children and our chickens , rabbits and goats.Where fair week was a live in event and one learned to love barn food with a sprinkling of alfalfa , constant washing of show whites and hot show rings. The Fresno county fair was in October due to the harvest. Back in the day the 4H'ers and FFA kids lived on family farms and the crops weren't in until September or so . The schools even based their opening dates on the crops for many a year.But dream on in the San Joaquin valley it isn't unusual to hit the show ring in October in 110 degree heat. This was a new experience for me. 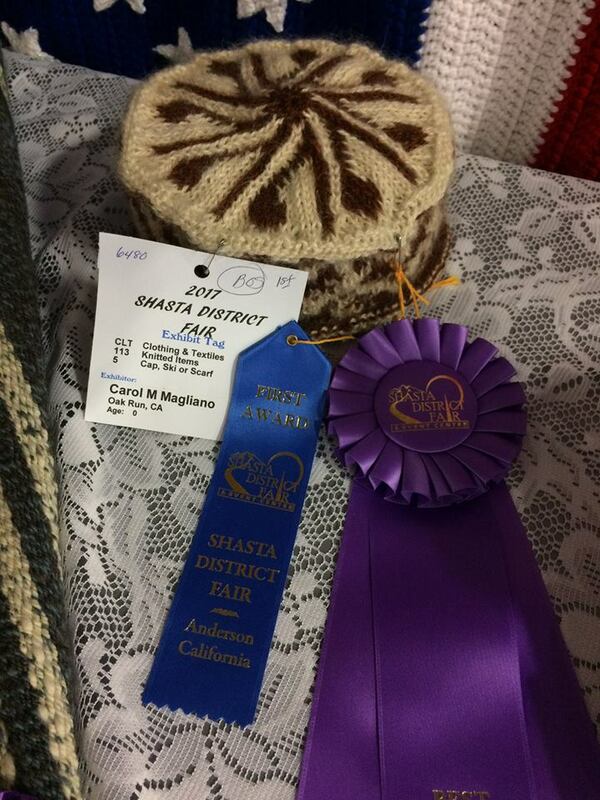 I judged the senior baked goods and demonstrated spinning in our both in the same building. The food was great and yes I made it through one entry packed division after another living to tell of it. I found these slippers in a knitted competition and fell in love. 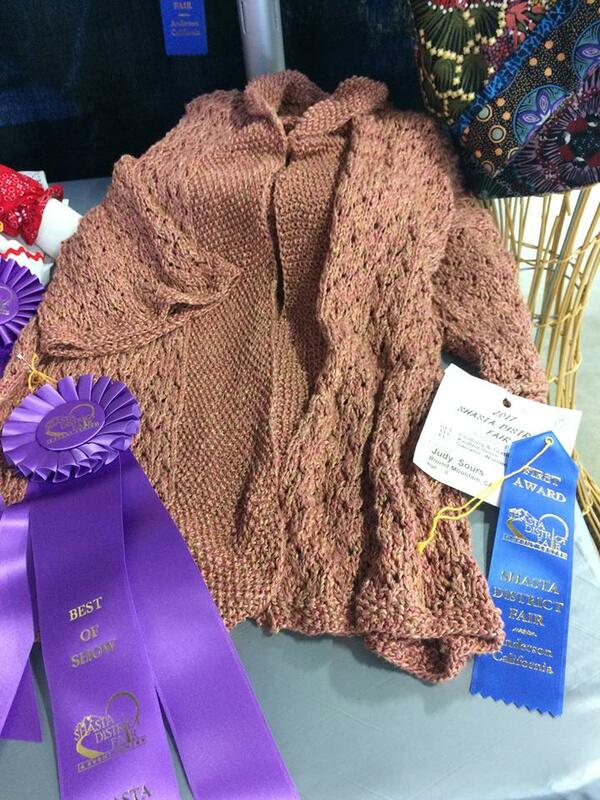 Then there were the BOS (best of show) choices. I was particularly pleased to see that in about 11 BOS 3 went to ladies from The Shed fiber group. Carol's Fair Isle style hand knit hand spun hat. A great time was had by all and I will try to remember to get a few pictures before I break the booth down come tomorrow. Prior to the fair I was in the valley attending to Miss. Emily's high school graduation. Emily is my second oldest granddaughter and has an eye on marine biology. She graduated 50 years after this Gammie did and it is a sweet bond to share. Same two only a few years younger. The weather has been weather. We have had 100 plus every day for a week but as of tomorrow relief is in sight. It has been better up here in the hills the valley really fried hitting the 108-113 range often and it certainly wasn't helpful that it stayed up in the low to mid seventies as a low. Almost thought I had been transported back to Fresno County on the Golden West Side. We lost the peas and the goats profited by that . Yum pea hay! The cukes never had a chance even though we were in the 104-107 range. The heat hit just when they were setting blossoms. The tomato's loved the heat but then the squirrels found the tomato's. We still are with the jury out on how that will fair. I had an ant infestation in the laundry room and kitchen. But after a late night floor cleaning and setting those liquid bait traps things look a bit more under control today. We will see. Everyone stay cool and enjoy the season. I will be back next week with more news from the farm and fiber pursuits.